Sabrina Karim is an assistant professor in the Department of Government at Cornell University. Between 2016-2017, she was a Dartmouth Dickey Center Fellow in U.S. Foreign Policy and International Security. Her new book, Equal Opportunity Peacekeeping (Oxford University Press, 2017) is coauthored by Kyle Beardsley, and it was the winner of the Conflict Research Studies Best Book Prize for 2017. This event is sponsored by Olin Library. 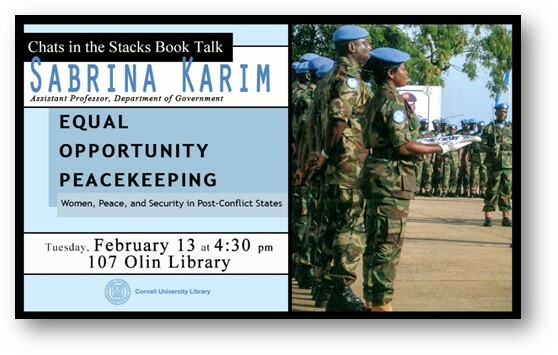 For more information about Olin Library events, visit olinuris.library.cornell.edu/events. All events are free and open to the public. Light refreshments served. For more information about the book talk series and to view recordings of previous talks, visit booktalks.library.cornell.edu. This is a Flickr badge showing public photos and videos from olinlibref. Make your own badge here.